You can test drive a car. You can try on a new pair of shoes. Thanks to a fleet of technology-focused mobile tours, now you can test out the Air Force. With five assets on the road (and another one coming), the Air Force provides engaging and informative experiences for potential recruits in their own backyards. As an Air Force producer, I'm responsible for the creation and/or operation of every tech touchpoint across all tours. The Performance Lab was my baptism by fire on the Air Force account. 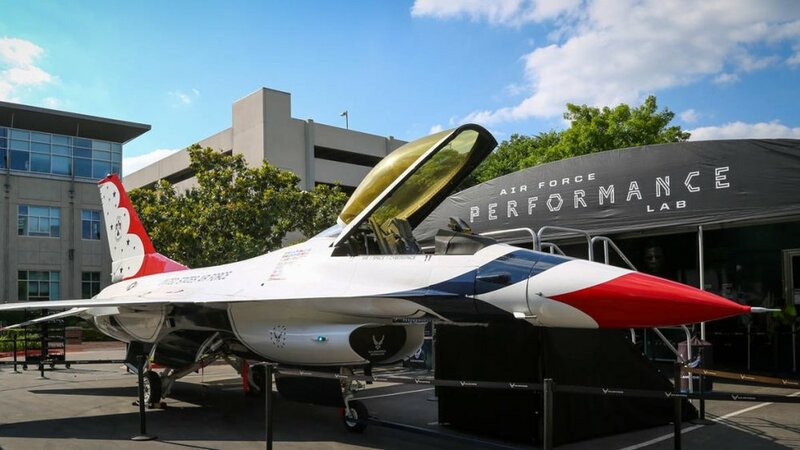 The current flagship tour, AFPL includes seven different technology touch points and a full-size f-16 Thunderbird. From touchscreen games to an iPad wall to an Oculus VR flight simulator, the tour is designed to test skills and re-engage visitors with personalized career content and recommendations. As lead producer on the creation of the ACE tour, I worked with the account and creative teams to turn an empty 39-foot trailer into the interior of a C130 cargo plane. Focused on the Special Operations career fields, the tour features an obstacle course, touchscreen gaming kiosks, and a 360 video headset experience. Partnering with Galpin Auto (of Pimp My Ride fame), we revamped the interior of a Ford Mustang to mimic the cockpit of an F-16 fighter jet. The mobile tour also includes touchscreen games and a 360 video experience. Rapid Strike is a seven minute simulator ride that takes visitors through missions that Air Force men & women perform every day.